Naval Amphibious Base Coronado is located on Silver Strand in San Diego County, California. The base is situated with the San Diego Bay on one side and the Pacific Ocean on the other, making it a major Navy shore command and the home of West Coast special and expeditionary warfare operations. The base is home to over 30 tenant commands including Commander Naval Surface Forces Pacific, Commander Naval Special Warfare Command and the Commander Expeditionary Warfare Training Group Pacific. 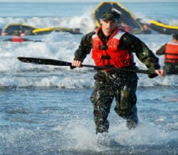 Coronado serves as the base of operations for SEAL teams and Special Boat Units. The "tied island" of Coronado is a prosperous town and its beaches have been named among the best in the country. With downtown San Diego only a short drive away, personnel stationed at NAB Coronado have plenty of cultural and recreational opportunities available. This Naval Amphibious Base Coronado directory features the critical info you’ll need to navigate through the many facilities and recreational opportunities available on base.